Time: 7:30 a.m., right after a surprising morning run. Nursing a sore shoulder/neck, I thought I’d take a day off to recuperate. But I spontaneously changed my mind this morning and put in a couple of miles. This gives me the opportunity to feel complacent and superior all day long! Place: At my main home computer. Listening: Right now, most of my music listening has to be dedicated to the writing of program notes for the Reno Chamber Orchestra and Reno Philharmonic, one of my tasks in life. One set of RCO notes is due this week, and a concert’s worth each of RCO and RPO notes the following week. Every now and again the orchestras program pieces that I’ve already written about, thus saving me some effort. 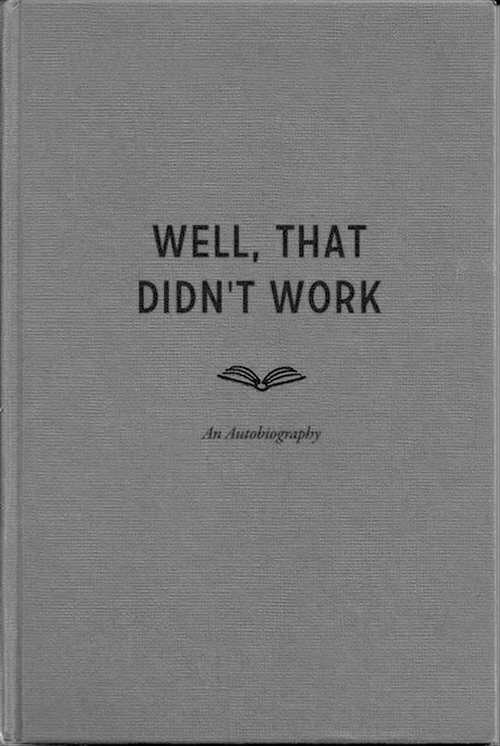 But no such luck this time. Today’s listening and writing will feature two Antonín Dvořák compositions, the Te Deum, which I’ve never heard before, and the Symphony No. 8, which I love love love. Once I get out of program note mode, I’m considering adding a weekly playlist to the blog to highlight the good music I come across. Reading: As threatened last week, I decided to take up Richard Powers’s novel Orfeo. I’m only about a third of the way through, but am so far finding it an unusually fascinating combination of road novel, bildungsroman, and meditation on both music and life in a time of terrorism. It sounds like an unlikely mix, but so far I’m quite engrossed. Powers’s descriptions of musical works like Gustav Mahler’s Kindertotenlieder and Olivier Messiaen’s Quartet for the End of Time are powerful. Also in the reading mix are Daring Greatly: How the Courage to Be Vulnerable Transforms the Way We Live, Love, Parent, and Lead by Brené Brown, and Ten Years in the Tub by Nick Hornby. Viewing: Only two films made their way to my eyeballs this week – both of them very recent films, a departure for this classic film viewer. The Grandmaster is Wong Kar-Wai’s latest film. Most, or at least much, of the critical attention for this movie seems to dwell on the fight scenes. While they’re admittedly done in a very stylish manner, they don’t seem that different from similar scenes in numerous other films I’ve seen (although many who are more knowledgeable than I have remarked on how innovative they are in depicting several styles of martial arts). I was drawn to the more meditative moments in the film, which are many, and recall the director’s films like In the Mood for Love, of which I’m a huge fan. Tony Leung Chiu-Wai and Zhang Ziyi are always extremely attractive stars, too. Speaking of attractive stars, Scarlett Johansson was the centerpiece of Jonathan Glazer’s Under the Skin, which I watched last night. Having read a bit about it, I was expecting it to be strange. But it proved to be even more strange and inscrutable than I’d figured. However, I like inscrutable, and found the movie’s tone admirably creepy and disturbing, and the lack of exposition (or much of any dialogue) most appealing. I can’t help but think that the films of Andrei Tarkovsky and, much to my surprise, my much-loved Thai director Apichatpong Weerasethakul were influences on the film’s imagery, pacing, and approach to narrative. Blogging: I’ve managed to follow through on my New Year’s resolution and get 2015 off to a decent start in the blogging realm. 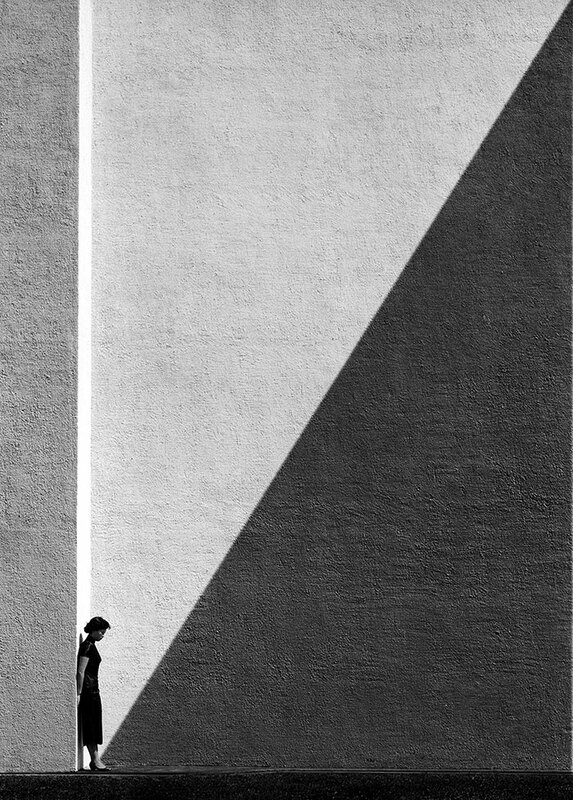 Along with two worthy quotations, this week I posted a brief feature on the excellent photographer Fan Ho, whose work is on display at the Modernbook Gallery in San Francisco through the end of this month. Pondering: While I have been keeping up a regular exercise schedule and, even through the holidays, eating pretty well, I had gone many weeks without seeing any weight loss. Apparently this is routine, as the body gets used to a new state of being. Suddenly, however, this has changed, and I’m down four pounds in the last two weeks. Perhaps the breakthrough I’ve been waiting (weighting?) for has finally arrived. Anticipating: Tomorrow I am tentatively planning to meet, for the first time in person, someone with whom I’ve been exchanging emails for several weeks. An increasingly common phenomenon anymore, it’s as though you know this person rather well on one level, and not at all on another. You’re meeting both a familiar friend and a stranger, and it’s impossible to know what to anticipate. I hope she will like me, and I her. 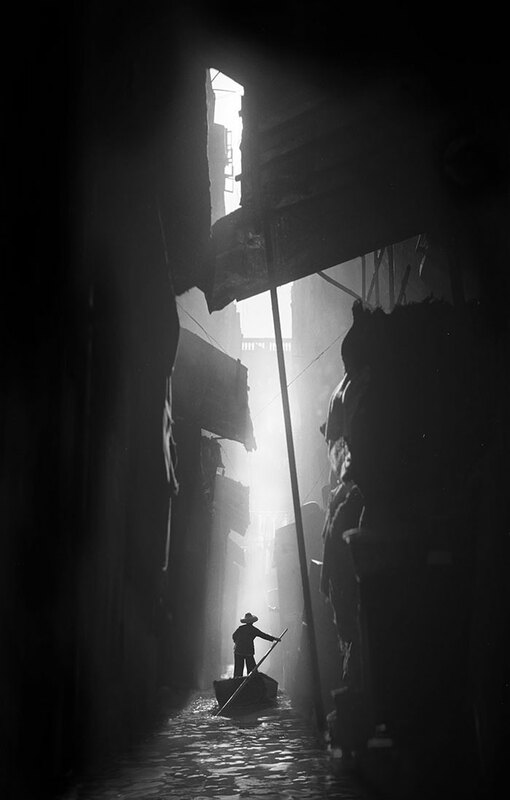 Fan Ho is a photographer, film director and actor. Born in Shanghai, now living in San Jose, and still alive and strong at age 77, he has been winning awards (some 280 of them) for his work since the 1950s. At an early age he moved to Hong Kong with his family. 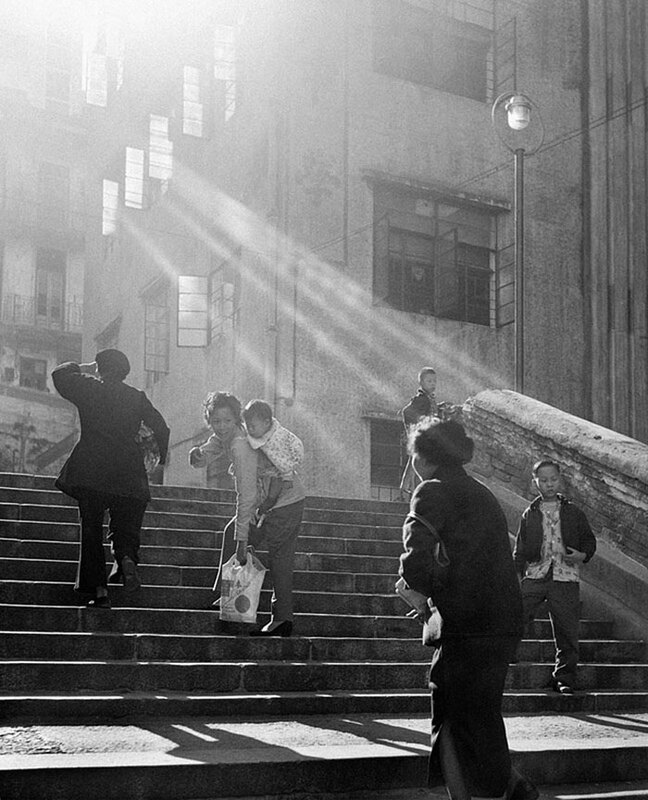 There he documented daily life throughout the 1950s and 1960s in beautiful, even haunting images, with striking contrasts of light and shadow. Most of those images were developed in the family bathtub. His photographs tend to focus on Hong Kong’s back streets, markets, and alleys. As you can see in the examples below, the images are exquisite; you can see more at the Bored Panda website (from which the four images below were drawn). In the early 1960s he became associated with the famous Shaw Brothers movie empire. Starting as an actor and assistant, he eventually had a chance to direct. Through the late 1980s he made some twenty films for the Shaw Brothers and other studios, some of which were selected for screening at festivals like Cannes and Berlin. But most would agree that it is his photographs that have had the most lasting impact. In recent years he has revisited his old negatives, exploring combining two images in montage and processing the result digitally. 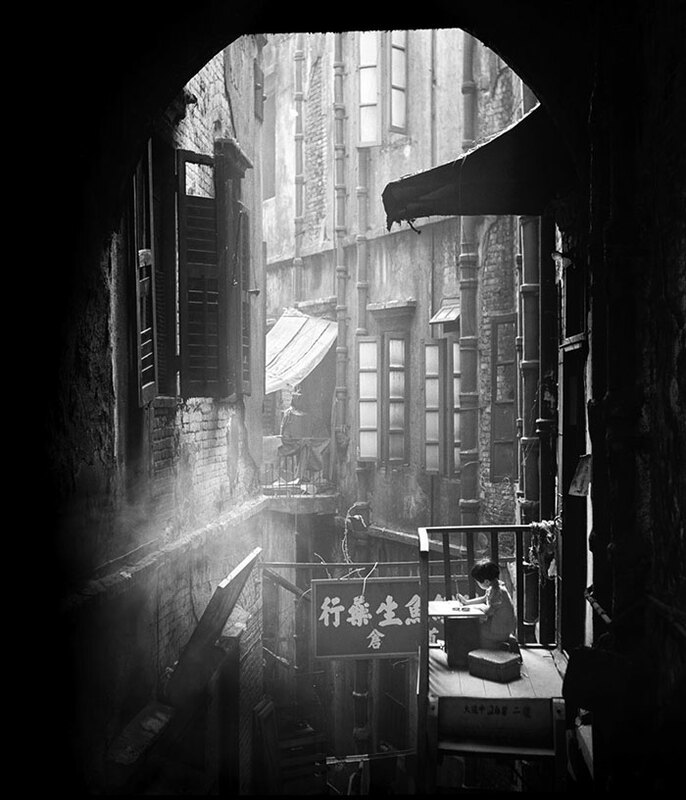 Many of those are featured in the book Fan Ho: A Hong Kong Memoir, as well as an exhibition of the same name that is on display through January 31 at the Modernbook Gallery (49 Geary Street, fourth floor) in San Francisco. Time: 7:30 a.m., right after my brisk (27 degrees) but satisfying morning run of about 2.5 miles. Place: At my main computer at home. Listening: My life ground to a halt right after Christmas when the Nevada Chamber Music Festival, a series of concerts (eleven in six days) that my employer, the Reno Chamber Orchestra, presents annually between Christmas and New Year’s, began. During that period my existence was tied to the Festival, and fourteen-hour workdays were the norm. Occasionally a meal was allowed, but I didn’t make a habit of it. By all accounts the Festival was a success, and what I heard of the music, which wasn’t much, seemed excellent. While I have a continuing gripe about being such an outsider-menial during the Festival (there are musicians that have been coming for years that I’ve still never met or spoken to), if the audiences had an excellent time, it really isn’t important that the staff does. In any event, music listening and movie watching and reading and eating regularly and other normal activities are only just now getting restarted in my life, and I’m very pleased about it. Reading: I used to be dedicated to the concept of reading one book at a time, but that has long since gone by the wayside. Currently underway are: Daring Greatly: How the Courage to Be Vulnerable Transforms the Way We Live, Love, Parent, and Lead by Brené Brown, and Ten Years in the Tub by Nick Hornby. Orfeo by Richard Powers is calling strongly to me, and that may get added to the in-progress list this morning. Also, the to-read stack has gotten larger as I kept rewarding myself during the Christmas season for getting presents purchased by buying myself more books. Viewing: My only film viewing in the last couple of weeks came last night, when I finally watched Jules et Jim (1962, directed by François Truffaut). It has been a hole in my viewing that I’ve long regretted – I confess that I didn’t even know that the film was set in the 1910s and 1920s! Now I have a notion as to why this film is so loved. The love triangle frame of the story in itself honestly doesn’t interest me too much. But the complexity of the emotions, the acuity with which Truffaut and the actors bring them to life, the way they are underscored and commented on by Georges Delerue’s lovely music, and the beautiful cinematography (Raoul Coutard comes through again!) completely won me over. Now it’s time to explore all the extras that the Criterion Collection so kindly provides. 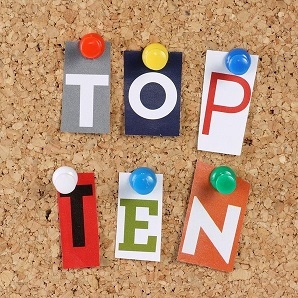 Blogging: My main recent feature was yesterday’s look at my Top Ten Blog Posts of 2014. To my surprise, it was a fairly productive year. Pondering: I’m doing my best not to do too much thinking these days. It only makes life more complicated. But I am keeping something of an eye on my New Year’s resolutions – they’re pretty simple ones, like losing some more weight and doing more reading and blogging. Anticipating: Resuming the normal course of my life again. Gratuitous Shakespearean New Year’s Resolutions: by Mya Gosling. When one is a blogger, it’s fairly standard behavior to look back on the past year, be disappointed in how little you’ve posted, and make a New Year’s Resolution to do better. Wanting to avoid being original in any way, I’ve decided to embrace this thinking, and to start 2015 right by looking back at 2014. Since this blog started back in 2010, 2014 was actually, to my surprise, my second most productive year. I averaged about one post a week, which is not terrible. These are the posts that statistics say reached the most people. This is actually fourteen separate posts on my February 2014 trip to Thailand, Laos, Vietnam, and Cambodia. This was also my biggest project of the year, so I wanted to call special attention to it. While I don’t have anything especially revelatory to say in this journal, I’m pleased with how it all turned out. And some of the pictures are nice. As far as single posts are concerned, this was the most popular of the year. Perhaps not coincidentally, the most popular post in the history of my blog, by a wide margin, is a similar explication of a painting with a religious theme, Giotto’s The Lamentation. This is an excellent book on a subject of great interest to me. Along with this review, I followed up with another post with a few thoughts on the same theme, Notes on Spirituality in Modern Art. This post and its companion, #6 below, were by far my most ambitious project of the year. After seeing the exhibition Out of Character: Decoding Chinese Calligraphy at the Asian Art Museum in San Francisco, I was desperate to learn more about a subject to which I had previously paid almost no attention. These two posts took months to put together, and while they don’t pretend to break anything like new ground on an exhaustively-studied subject, I believe that the information is accurate, and interesting (to me at least). A meme that was making the rounds at the time. Ask me about this in a few months, and I may have a new list for you. A review of the catalog for the Asian Art Museum exhibition of the same name. See #4 above. I believe that I first read about the Hungry Ghosts in the Tibetan Book of the Dead, and wanted to know more about this theme that ranges more widely, geographically and historically, than I might have guessed. A review of a lovely book on a fascinating subject. The art that comprises a good portion of the book is beautiful and very well-chosen. A work by a very interesting artist that I came across on someone’s Tumblr. Another meme that was current a while back. Some of the questions weren’t especially relevant to my experience, but many were, and it was interesting to contemplate some of the issues raised.